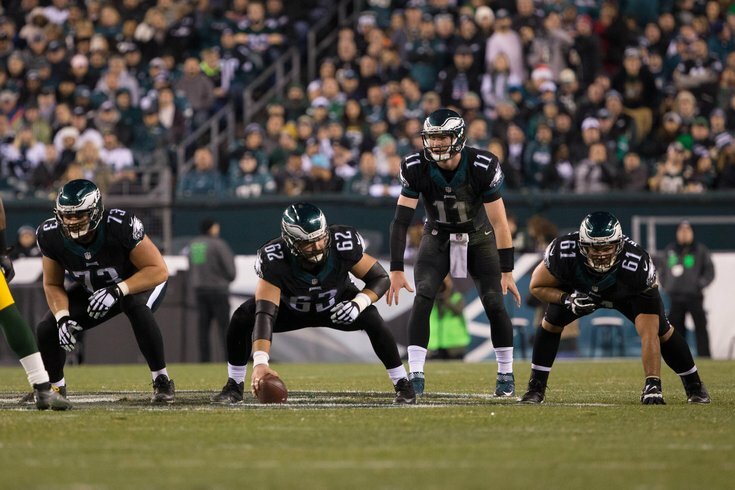 The Eagles' interior offensive line is among the best in the NFL. Now that the Philadelphia Eagles' offseason is (finally) underway, let's take a look at each position and figure out which players will be back in 2018, and which ones will be playing elsewhere. Here we'll look at guard and center. Legendary former WFAN radio host Mike Francesa thinks the Eagles should cut Jason Kelce. "You got kids who take off from school," Francesa began. "You got families, who, you know, this is a life experience for them, to be at a Super Bowl for a city. And you get up there and go onto a 15-minute profanity-laced tayride, tyride, tirade? It's ridiculous! Nobody wants to hear that. If I were the owner, I'd cut him." #JimmyVerdict: Counterpoint: Jason Kelce is a first-team All-Pro and Philadelphia living legend. The owner probably won't cut him. Brooks had a great season, earning a Pro Bowl nod, and overcoming his anxiety. Brooks and Lane Johnson form the best RG-RT combination in the NFL, by a country mile. Brandon Brooks: Stay or Go? After starting the season on the bench behind Isaac Seumalo and then splitting time with Chance Warmack in a strange "OG by committee" approach, Wisniewski left no doubt that he was the best man for the starting LG job and had a very good season. In addition to starting at OG, Wisniewski has the versatility to play center. Stefen Wisniewski: Stay or Go? Seumalo was one of the extremely rare disappointments on the Eagles' roster this season. He started the first two games, but was benched after a dreadful performance Week 2 against the Kansas City Chiefs. As the season wore on, Seumalo did get playing time once again, as the sixth offensive lineman in the Eagles' jumbo sets. #JimmyVerdict: The Eagles aren't going to give up on Seumalo. They like his versatility, and at a minimum, he's a player who can fill in at multiple spots as a backup. Isaac Seumalo: Stay or Go? Warmack was surprisingly given a contract extension before he ever even played a game for the Eagles. As noted above, when Warmack and Wisniewski were splitting time in the "OG by committee approach," it was clear that Wisniewski was the better player. Still, Warmack did fill in capably at times when Wisniewski went down and represents quality depth at guard. #JimmyVerdict: It's a full sweep of "stay" for me along the interior OL. Chance Warmack: Stay or Go?